From a rain barrel to a plastic garbage bin, nearly every homeowner has some type of plastic barrel in their house. Painting these barrels keeps them neat and allows you to decorate them or camouflage them to your liking. Manufacturers have developed aerosol and brush-on paint that sticks to plastic; this is available in a wide array of colors. Painting is not difficult, but does require one to two hours of preparation time, plus several hours or drying time. Work outside on a clear day with low humidity. Paint plastic barrels so they blend in with your home. Combine equal parts distilled white vinegar and water in a bucket. Then dip a rag in this solution and clean dirt and grime from your your rain barrel by wiping the outside of it. Rinse the rag in the cleaning solution as often as necessary until the entire rain barrel is clean. Skipping this step leads to a gritty finish in the paint job. Rub 220-grit sandpaper over the surface of your plastic barrel once you've cleaned it. Roughing up the surface of the barrel helps the paint adhere. Wipe the exterior of your barrel with a clean rag to remove any plastic shavings. Cover any areas of the plastic barrel that you don't want painted with masking tape. If you're painting a rain barrel, for example, place masking tape on the spigot so you don't accidentally paint it. 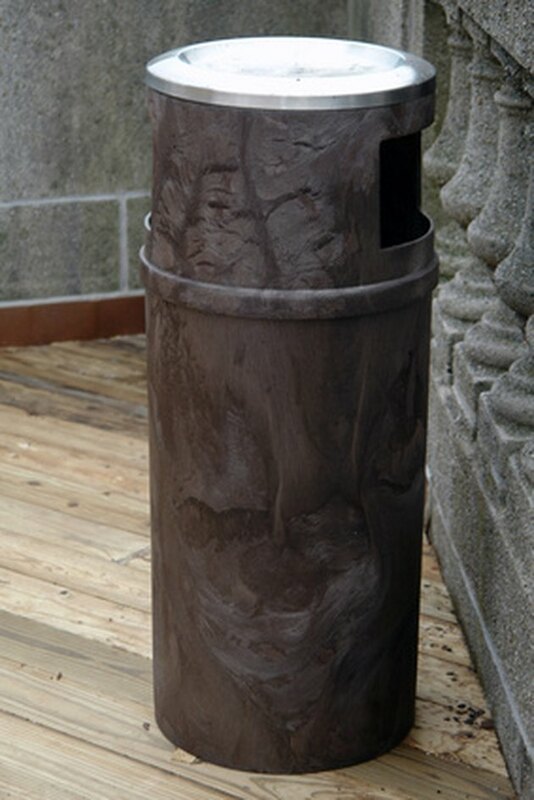 Coat the plastic barrel with a primer, using either an aerosol primer or a can of paint and a brush. If spraying, hold the can eight to 10 inches from the surface of the barrel and spray back and forth. If the paint runs, you're using too much. If using a brush, apply a thin, even layer of primer--too much can drip and create a messy finish. Wait the recommended time for the primer to dry (see manufacturer's instructions for this). Apply a coat of paint in the same manner as you applied the primer. Let the coat of paint dry. Then apply another coat in the same manner. Allow the plastic barrel to air dry for 24 hours before using.